Mangaluru, Dec 07 2017: The experience was unique and different for at least 51 youth of Uttarakhand who were on an inter-state youth exchange programme under the initiative of Ek Bharath Shreshtha Bharath of Nehru Yuva Kendra Sanghatan in Karnataka. The skyscrapers of Bengaluru and Mangaluru, the palace and KRS dam in Mysuru, beaches and Kambala in Mangaluru and travel by train covering six states gave them an experience as never before. At an interaction with media here on Dec 6, Wednesday, Vibhu Krishna from Almora district of Uttarakhand said that Uttarakhand is a hilly area with extreme cold weather throughout the year. “We were excited to get a glimpse of the beaches in Mangaluru. A journey by train too has been a new experience. A visit to Bengaluru looked like we are visiting a new country. We loved Kambala in Mangaluru. Instead of roti and dal, we have started liking idli, sambar, dosa and vada.” The youth exchange programme has helped us to showcase the rich heritage and culture, customs and traditions of the state enabling people to understand and appreciate the diversity of India. Stating that there are no job opportunities in Uttarakhand, she said that there are ample opportunities in Karnataka. The youth clubs in Dakshina Kannada are over 50 years old while in our state its hardly four to five years old. Because of the industries in the region, the youth clubs get CSR funds to sustain as well. Further, gram panchayat buildings in Dakshina Kannada have good buildings, which is absent in our native. She said that Uttarakhand lags behind in health care and education sector as well. People have to travel for a long distance to avail health care facilities. For C S Danu, the people of Mangaluru are friendly and cooperative as they attempted to converse with them in Hindi unlike other South Indian states like Tamil Nadu. He felt that corruption is rampant in gram panchayats in Uttarakhand. Nehru Yuva Kendra district coordinator Cinthia Lobo said that 50 youth from Karnataka will leave for Uttarakhand on December 25. The youths from Nainital, Uttarkashi, Almora and Pauri Garhwal are attending this exchange programme. The exchange programme is being organised to create an environment which promotes learning between states by sharing best practices and experiences. Through this innovative measure, the knowledge of culture, tradition and practices of different states and Union territories will lead to an enhanced understanding and bonding between the states, thereby strengthening the unity and integrity of India. 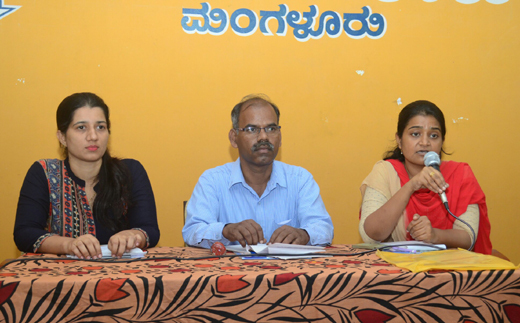 Yenepoya in Mangaluru has arranged for boarding and lodging for the four-day programme in Dakshina Kannada. As part of the exchange programme, the youths from Uttarakhand interacted with Yuvaka Sangha, Thokur, Vidya Vinayaka Yuvaka Mandala, Haleyangady, Yuvaka Mandala, Sasihithlu, Sasihithlu beach. They also visited NMPT, MRPL, interacted with students of Govinda Dasa PU College, Yenepoya, and Mangala Grameena Youth Club, Konaje. They also interacted with Sanooru GP members, visited Thousand Pillar Basadi, Gomateshwara Gudde, Attur Church, Syed Madani Dargah, Gokarnanatha Temple, and St Aloysius Chapel and also interacted with Vice Chancellor of Yenepoya. Is it not more fitting to show the youth rather than these stooges?